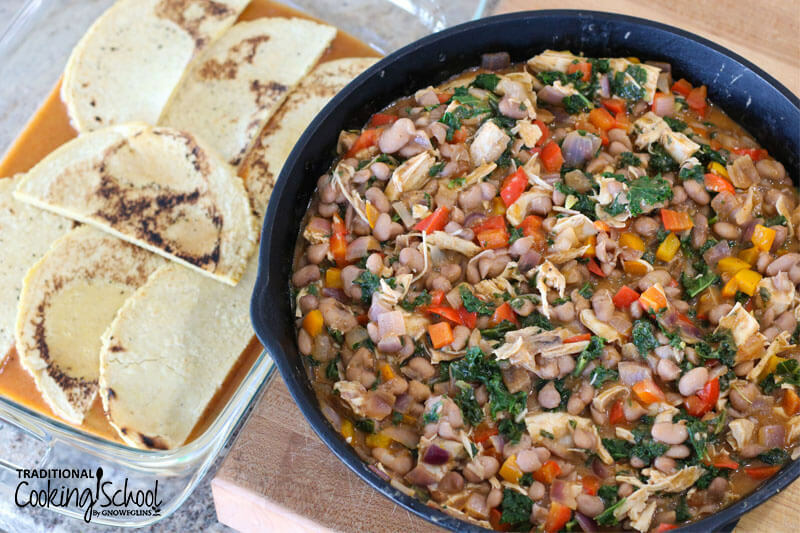 Looking for healthy Mexican recipes like… easy chicken enchiladas?! When a friend inspired me to make enchiladas the other day, I knew I had to find a way to make the tortillas and sauce from scratch. The corn tortillas (find the recipe here!) were so fun to whip up, and gave me an excuse to try out the never-before-used tortilla press! And as for the homemade enchilada sauce, let's just say I could make a roux in my sleep now. I purposely left the enchilada sauce on the not-so-spicy side, since I don't want to burn the taste buds off my toddler's (or my) tongue. 😉 But you can up the chili powder, if desired! 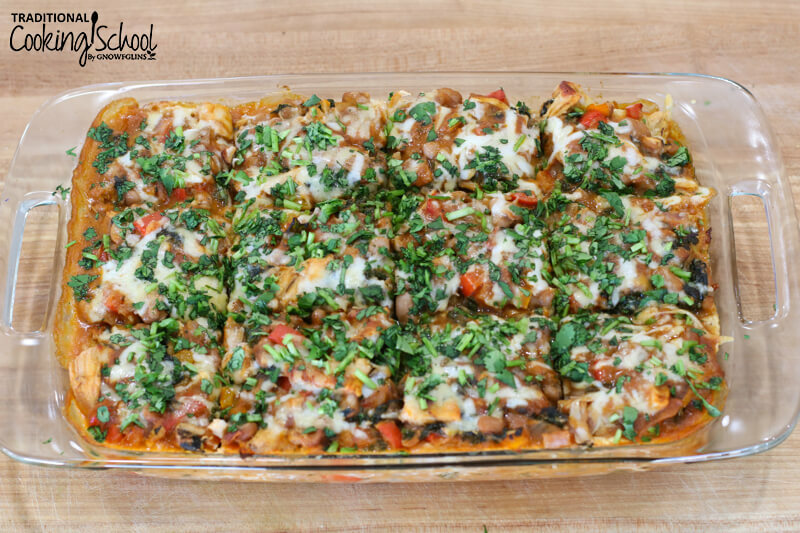 This enchilada casserole is the perfect recipe for when you already have leftover chicken and beans in the fridge. 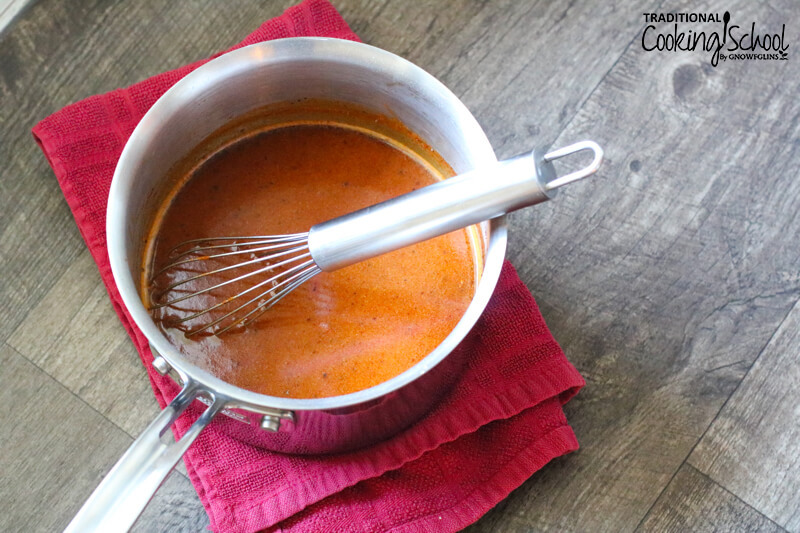 Then simply saute them together with the veggies, whip up a batch of the enchilada sauce in less than 10 minutes, and pop it all in the oven with tortillas (made ahead of time, or store-bought)! It's a breeze! I didn't eat much Mexican food when I was growing up, but I love the flavors. So I'm excited to incorporate more healthy Mexican recipes into our dinner routine. Enjoy! I challenged myself to learn how to make enchilada casserole from scratch -- and it turned out so yummy! 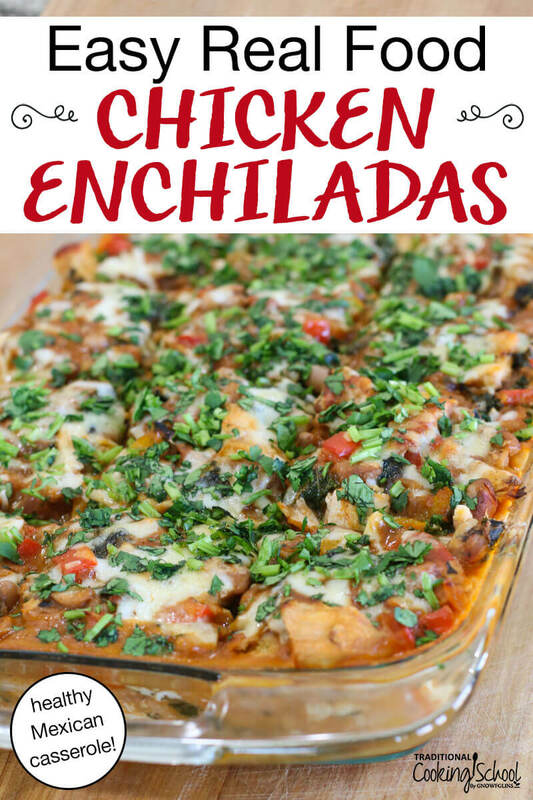 With authentic Mexican corn tortillas, homemade red sauce, lots of vegetables, and soaked beans for better digestion, these easy chicken enchiladas are sooo healthy. Top with chopped fresh herbs, sour cream, and avocados... and enjoy for dinner or even breakfast the next day! Can you EVER beat homemade comfort food?! Melt butter in a medium size pot over medium heat. Whisk briskly to combine and continue whisking for 1 minute, letting it cook. Stir in tomato paste and seasonings. Slowly add broth, continuing to whisk. Once combined, increase heat to medium-high. Bring sauce to a simmer and let thicken. 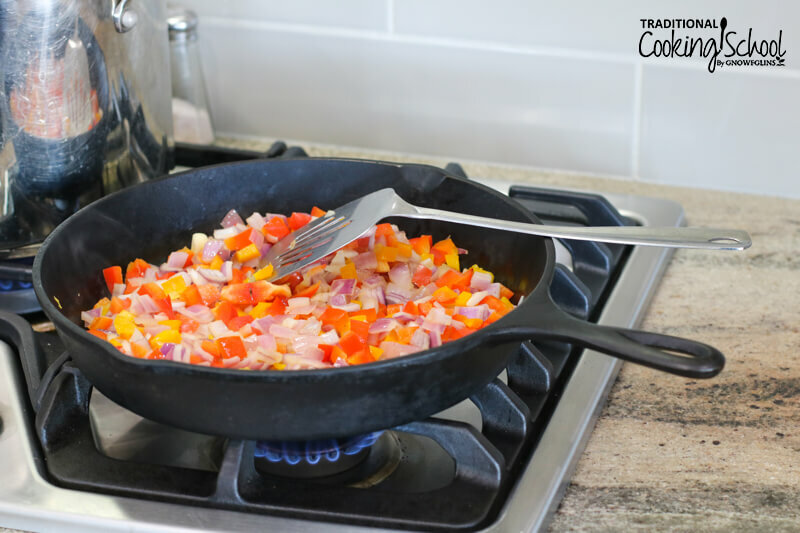 Saute butter, onion, and bell pepper together until soft. Add 2/3 of the finished enchilada sauce. Stir. Add kale, let it wilt for a minute (cover the pot if necessary), then stir it in. 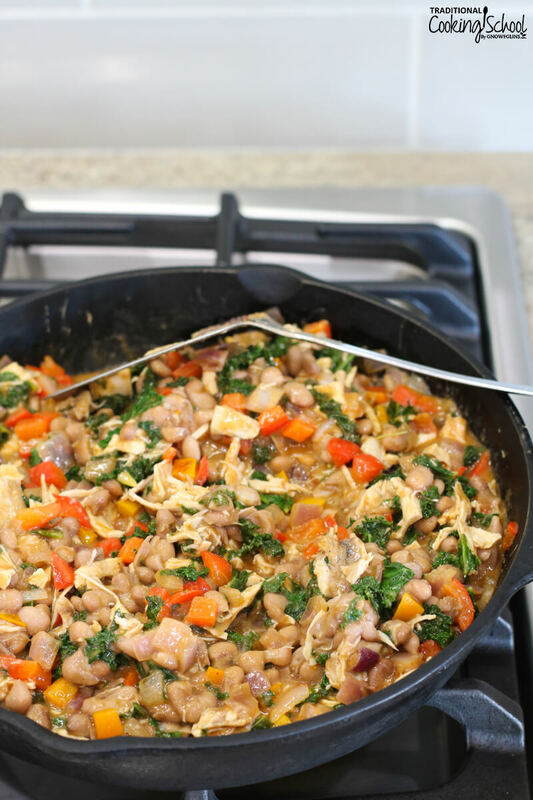 Stir in chicken and beans. Add sea salt, to taste. Pour 1/2 of the remaining enchilada sauce into a 9x13" casserole dish. Cover bottom of the casserole dish with a layer of tortilla halves. Layer 1/3 of the chicken mixture over the tortilla halves so they are evenly covered. Sprinkle 1/3 of the grated cheese in an even layer over top of the chicken mixture. Finally, layer again with tortilla halves, remaining 1/3 chicken mixture, all remaining enchilada sauce, and remaining 1/3 grated cheese. Bake for 25 to 30 minutes, uncovered. Once warm and bubbly, remove from oven. Garnish with fresh cilantro, avocado chunks, and sour cream. Enjoy! Beef variation (instead of chicken): When making filling, brown 2 pounds ground beef with onion and bell pepper. (Omit butter unless beef is very lean.) When fully cooked, drain liquid and discard. Add 2/3 of the enchilada sauce and proceed as written to assemble the enchilada casserole, with the exception of 2 cups of pinto beans (instead of 4 cups). 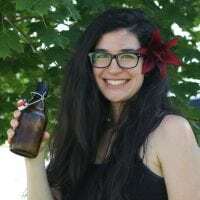 What is your favorite healthy Mexican recipe? 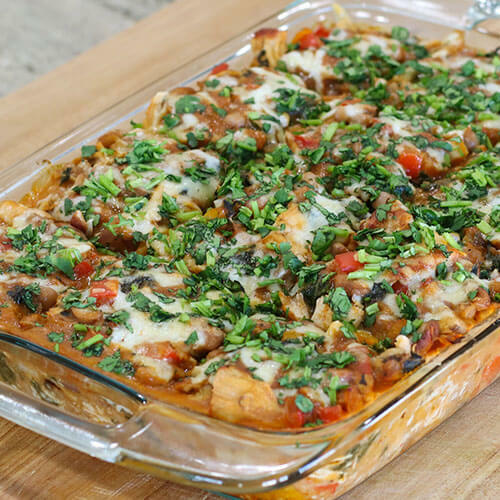 Will you try this enchilada casserole?